The reporting functionality available in ApprovalMax is particularly popular with our users, and we’re pleased to announce a brand new enhancement to it: Bill Accrual reports for Xero. The Bill Accrual reports feature has been highly anticipated by companies that practice accrual-based accounting, and that strive to minimize manual entry of the accrued liabilities in Xero. In ApprovalMax, the Bill Accrual capability allows users to generate collections of open Bills using ApprovalMax’s filtering and reporting capability, before automatically importing the resulting .csv file to Xero via its capability to import manual journal entries. Taking full advantage of this brand new feature couldn’t be simpler. First, in the Company menu, open the “Reports” folder. 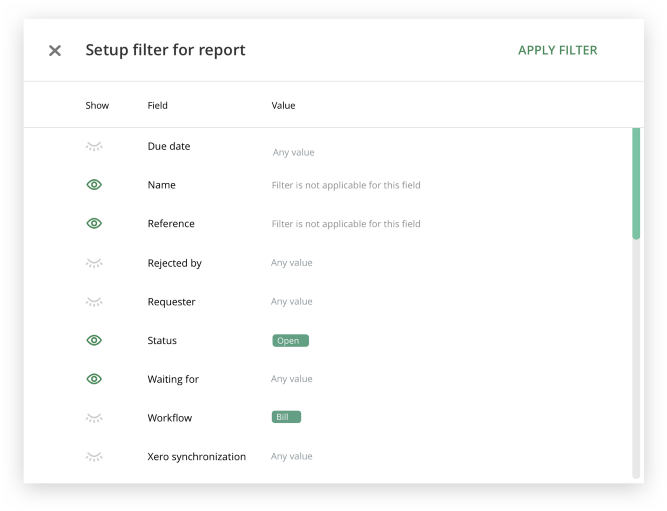 Next, in the “Reports” folder, click the “Create report” button, and then click the “Edit Filter” button to select the filter criteria you need. For example: “Workflow > Bills” and “Status > Open”. ApprovalMax also enables more granular filters, such as filtering at the line item level, or selecting parameters such as “Accounts” or “Tracking categories”. Selection of filter criteria for the Bill accrual report. The next step is to create the Bill Accrual report by opening the ‘Three dot menu’ and selecting “Create Bill Accrual Report”. Your report will then be created automatically. Creation of the Bill Accrual Report. What’s more, you can enter the Bill Accrual report narration, which will appear as the narration of the manual journal entry in Xero. And ApprovalMax also allows you to enter the date and the accrual account details in the report. Once this has been completed, ApprovalMax’s job is done. To complete the action, you need to open Xero, click on “Import” on the Manual Journals page, and select the file generated by ApprovalMax. This way the collection of line items from the selected Bills that are subject to accrual will be added to the Manual Journal entry draft, ready for editing and posting within Xero. If your company practices accrual-based accounting then this enhancement will save you a significant amount of time when it comes to manual data entry in Xero. The Bill Accrual report is the result of a specific user feature request, and yet another example of ApprovalMax responding to the needs of its users. Do you have a similar idea? One that will make your life easier, and help take ApprovalMax to the next level? Let us know by posting to our Knowledge Base.